The buzz in the Southern suburbs is about new Bistro Sixteen82 at Steenberg. A Friday 13th opening date didn’t appear unlucky at all, because tables were never empty for long when I visited for a Saturday lunch on the second day of business. Chef Brad Ball’s reputation has something to do with it. Ball spent time in neighbouring kitchens of Spaanschemat River Café and Pastis in Constantia, and his style hovers between café and bistro. The Bistro Sixteen82 dining space leads on from Steenberg’s new interactive tasting room with fanciful glass art – coloured decorative glass hanging from the ceiling are supposed to look like grapes, and a tiered champagne flute construction below. The dining space is easy on the eye in white and cream linen, vinyl and raw wood under a ceiling of driftwood. Wine bottles form part of the glass backdrop. A raised glass and charcoal walled area overlooks the winery in what is termed a Raw Bar (serving charcuterie, sushi and fish gravadlax or other dishes that don’t require cooking). Outside tables overlook a water feature to landscaped pathways beyond. A children’s menu is available but raucous families beware - this is chic country territory. The bistro serves breakfast, lunch and tapas, and I liked what I saw on plates. 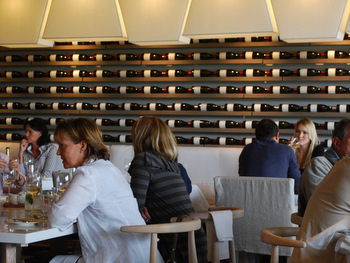 The wine list is geared towards Steenberg wine ranges – all served in carafes, with MCC by the glass – plus a smattering of other Constantia wines. Sample lunch menu: Small with four categories. ‘Stimulate’ – risotto, roasted marrow bones, Norwegian salmon gravadlax and the like, priced around R50. ‘Rejuvenate’ focuses on salads, in half or full portions at around R45 to R75. ‘Experience’ only has one option, a go-the-whole-hog dish called Steenberg Magna Carta of scallops, salmon, foams and oysters. ‘Inspire’ averaging at R70 to R120, from steak and aioli sandwiches to more substantial meaty offerings. ‘Indulge’ includes a few sweet options and a cheese board, at around R50. TIP: Salad portion sizes are a little mean (the table next to us provided a running commentary about the “poor value”). 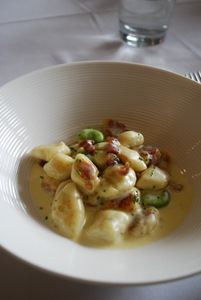 But in the ‘Inspire’ section the gnocchi with pancetta chunks, broad beans and creamy, cheesy Parmesan Anglaise sauce is so good you’ll want to order a second. 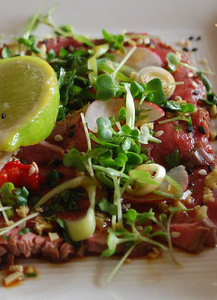 Seared slices of grass-fed beef tataki taste delightful, dressed with an Asian drizzle of sesame oil and soy with micro herbs, radish, chilli, ginger and squeezes of fresh lime. You’ll want to ‘Indulge’ in a dark chocolate fondant/hazelnut praline and butter cream layered cake named ‘What’s it called Dave Jones?’ too. It’s quite sublime. Your blog is looking brilliant. Your food shots are excellent. Well done. I recently went to the bistro and had one of the most amazing experiences at any restaurant for a while. My mushroom risotto was perfect to say the least. I followed this by the cob with Nicoise veg and verjuice butter. Wow, verjuice butter! My wife had the sweetbreads and cherry brioche, Awesome. We shared the "Dave Jones dessert. You are right in saying it is sublime! will definitely be back. Thanks for a wonderful blog, wish I could take pics like that. Great Blog Kim. Love your pictures and your writing is always fabulous!! Well done, glad I have found it! The Real name of that "Dave Jones" dessert is Marjolaine".